This is something I have always tried to hold close to my heart. It is one of the hardest things to do, and I struggle with it all the time. With that said, I completely understand the need for it. You never know what is going on in someone’s life, and you can never be sure of the things causing them to be unkind or negative towards you. I am usually able to hold back my passive-aggressive nature when speaking to someone in person, and can almost always turn the other cheek and be kind when faced with rudeness. The real struggle that I have is when it comes to online interactions. People seem to have this intensified sense of freedom when they’re speaking to people online and with the cloak of invisibility over them (see what I did there?) and this mask of anonymity, they often say whatever comes to mind, even if it isn’t very nice, or isn’t necessary to say to someone. I’ve had to remove a couple comments on my posts from people that were just being hateful for no real reason, but for the most part, I’ve been very lucky and have had some truly lovely people following me and commenting on my posts. For that I am grateful, but I’ve also come across so many comments on other posts throughout the internet where there are an abundance of incredibly unkind and horrible things being said to people, that I know with fair certainty these people wouldn’t say to someone in person. I just don’t understand why people feel the need to be this way? With all of that said, I do my best to always ignore those things, and just focus on the positive. Rather than replying to someone’s negative comment on a post, I try to just make my own positive comment to balance out the negative if I can. The hard part is trying to stay away from the urge to jump into the trap of using internet anonymity to be mean to the people leaving rude comments. I’ve felt the urge more than once to try and knock someone down a peg or two and to try and make them understand why the things they’re saying are wrong, but if I do that, I’m no better than they are, even if I’m “fighting for a noble cause” through all of it. I feel like I may be getting slightly off track here and rambling a bit much, but I suppose the moral of this story is that I am, and have been for as long as I can remember, striving to be the bigger person as often as I can. Because nothing good can come from being unkind to someone that has done the same to you. They could be going through a lot in life, or may not have had the best influences, and they may just need a little kindness thrown their way to help them along. 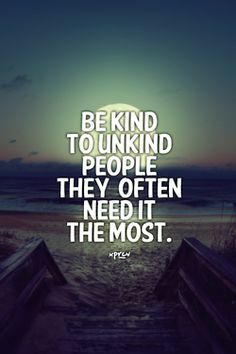 So to anyone that often leaves unkind or rude comments on the internet, or tends to be mean to people they are speaking to in the “real world”; I hope that you are able to find the kindness that you need, and I hope you are able to see how your words can hurt people. As much as you may be going through, the person you are being mean to could be dealing with struggles of their own. As humans we should strive to build each other up, not tear each other down. I hope we can all live our lives in this way. P.s.- To the person that inspired me to use this quote in this post, I’m sorry that you feel I am being impolite by being behind on replying to comments left by lovely people on my last two posts. I have had a very busy and stressful last couple of days and had to let the smaller things (like simply replying to some comments) be pushed to the side for a little bit to be able to make it through life. I hope I can catch up and make you a bit happier about the situation. I apologize for falling behind.